Interested in growing your business at the heart of the UK’s biggest manufacturing region? Then come and see us at Smart Factory Expo – Europe’s biggest showcase for the Fourth Industrial Revolution (4IR) – a revolution in manufacturing agility, innovation and thinking held right here in Liverpool. Smart Factory Expo is where technology, finance and manufacturing meet and it’s set to attract over 6000 visitors and 200 exhibitors, making it one of the world’s largest showcases for digital manufacturing – comprising of six dedicated exhibition zones – Industrial Automation, Internet of Things, Digital Transformation, Smart Factory, Manufacturing Innovation, Industrial Data. Running through the entire exhibition is ‘Innovation Alley’ – a showcase for manufacturing tech start-ups, ensuring that the whole 4IR ecosystem is represented. Liverpool City Region is at the heart of the biggest manufacturing region in the UK. Our region is bursting full of innovators and entrepreneurs that are revolutionising their industries. Not only will you find individuals and creators; we also have the right infrastructure to nurture and support them. We’re famous for the quarter of a million cars made here each year; and for Europe’s biggest bio-manufacturing cluster. We’re known for the hundreds of global brands that are made here. But we’re not only making things here; we’re making them better, greener, safer and more efficient. We excel at Supercomputing; Robotics; Virtual Reality; Internet of Things; Sensors; Big Data and Big Science. We’ve got the largest supercomputing facility for industrial applications in the UK and the highest concentration of robotics for materials science in the world. 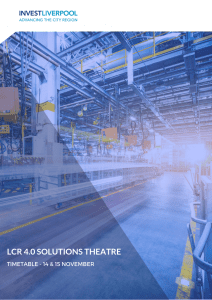 Not only that, our pioneering LCR 4.0 project is a UK manufacturing first that puts the heart of an evolution which is set to transform production in the modern world economy. Find out more about our exciting programme of speakers in the dedicated LCR 4.0 Solutions Theatre HERE. Find out about the benefits and opportunities of growing your company in the UK, and specifically Liverpool City Region by arranging a meeting with us on our exhibition stand at Smart Factory Expo located in front of the main entrance as you enter the hall. Please email Tony O’Neil on [email protected] to arrange a time and find out more.